Very high build quality pallet trucks from Sweden, manufactured by BT Toyota. Optional quick-lift pump with overload valve. Full parts and service back-up. Used in production on an assembly line. The operator now has a good working position when parts are removed from stillages. 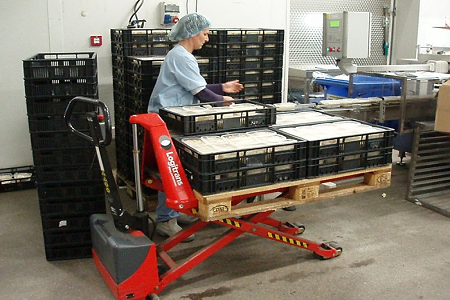 This Logitrans Highlifter is used to assist operators at a food processing plant. The High Lifter allows for a better working height when loading crates on to pallets. The next step up from a hand pallet truck, 1500 kg capacity, power drive and built-in charger. The smallest powered pallet truck with a big capacity of 1500Kg. 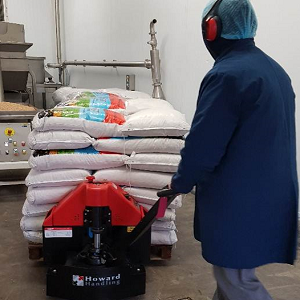 We supply exceptionally high quality stainless steel hand pallet trucks and pump trucks, both semi and fully stainless scissor lifts, stainless steel pallet stackers and stainless tilts, turners and rotators for food production which are designed for wet and corrosive environments. 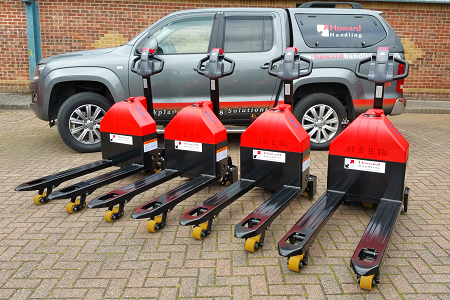 The Logitrans range of pallet trucks & stacker trucks can be customised with bespoke forks for handling non-palletised items such as crates, dolavs, IBCs, Eurobins and tote bins. A very high quality hand pallet truck with additions to provide better protection in damp or corrosive environments. Fitted with stainless steel greaseable axles and bearings and supplied with cold store oil, for freezer use. This is not a substitute for a stainless steel hand pallet truck - but may be a more cost-effective alternative, in areas where fully stainless is not required, but where additional protection is needed. 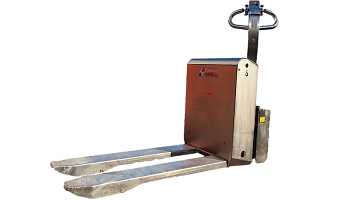 A Logitrans EHSRF stainless steel electric pallet stacker is modified with bespoke V-march arms for lifting and moving 200 litre Eurobin Tote Bins. Both plastic and stainless steel tote bins can be handled. Logitrans stainless stackers are available in both manual and electric versions and are ideal for food production environments. All surfaces in contact with goods are made from highest grade 316 stainless steel. 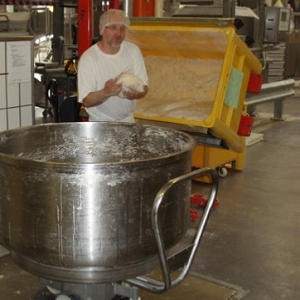 This electric High Lifter is used in a food producer's packing area. The Highlifter lifts EUR pallets, allowing the operator to pack the goods at an ergonomically correct working height. It reduces operator bending and stretching and thus the risk of back injuries. 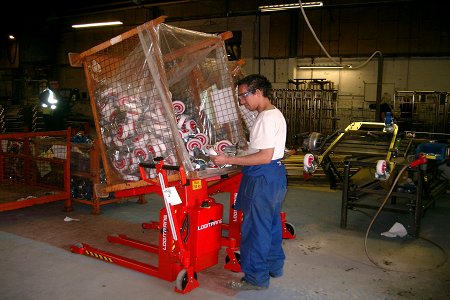 The Logitrans tote bin Rotator is suitable for lifting and rotating 200 litre Eurobins. 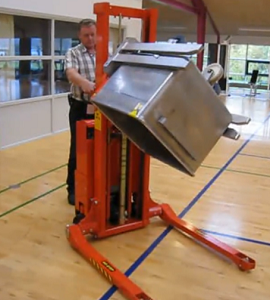 Eurobins can be lifted and turned through 180 degrees each way, for emptying and filling. The Rotator can be supplied in both powder coated and stainless steel versions. The stainless steel Rotator is useful for food processing, high hygiene and corrosive environments. This particular Eurobin turner has powered lift & rotate. A fully powered version (electric lift and propulsion) is also available. 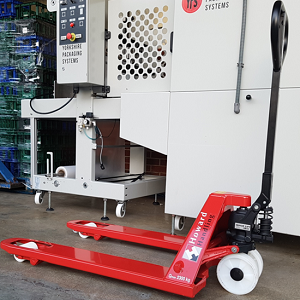 A powered pallet truck is used to move palletised bags from a packing area into the warehouse, in a food industry environment. 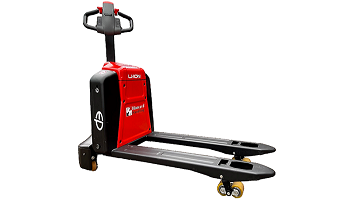 This particular model is small enough to be used on a delivery vehicle, is easy to use and has a large 1.5 tonne lift capacity. 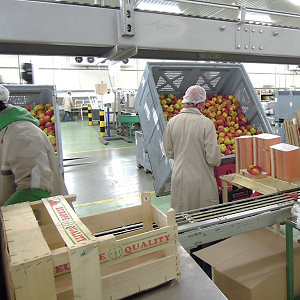 The Logitrans Rotator is used in many Food Production sites for safer handling of goods for operators. Rotators can be used for Pallets, Boxes, Crates and Dolavs. The Rotator has small dimensions (perfect for confined spaces) and a capacity of 1000 kg. The Logitrans electric tilt is used here by a food producer to lift crates to working height, when filling and emptying them. A tilt prevents the back injuries caused by frequent bending. Logitrans electric tilts are also available in stainless steel. A scissor lift pallet truck is modified with a custom bespoke plate. It is used in a food production application, for moving reels of packaging film and lifting them onto machinery. 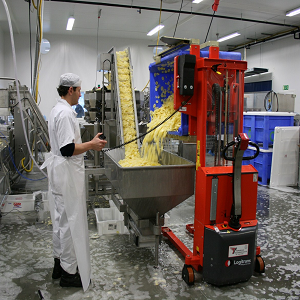 A Logitrans Rotator with side tilting forks is used in a food production area . The Rotator lifts and tilts crates to an ergonomically correct working position, allowing the operator to easily access the contents. In this environment, the Rotator prevents operator strains and injuries associated with repeated bending and stretching. 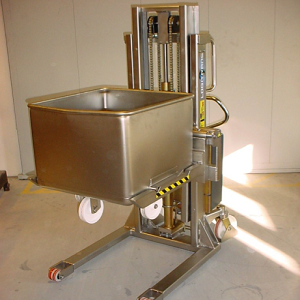 A stainless steel hand pallet truck is modified with bespoke forks, to lift and move kettles in a food production site. Pallet trucks are available in both semi stainless, and fully stainless versions. The Logitrans stainless steel range is ideal for environments with strict hygiene requirements, clean rooms, wet and aggressive environments. 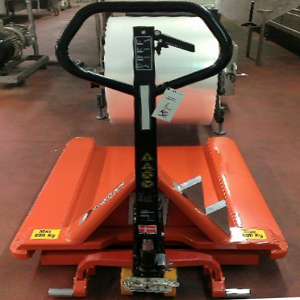 We can also tailor our stainless steel pallet trucks and lifters for non-standard applications. RF-PLUS products are stainless steel with an electro-polish finish for a very smooth surface, with few hiding places for bacteria. 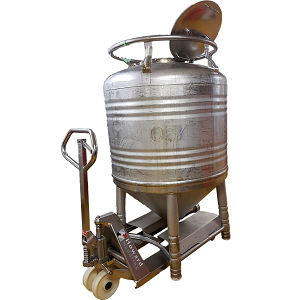 These pallet trucks and handlers can be cleaned and are resistant to cleaning materials with chlorides. 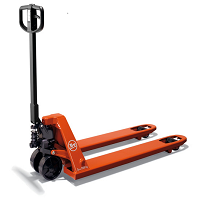 RF-SEMI products are perfect for industries which do not require fully stainless steel pallet trucks and lifters. Parts in direct contact with food and other product are made of stainless steel. Other parts are chromit treated or coated in polymer plastic for protection against moisture and corrosion.